There's a time and a place for — shall we say — traditional Halloween decor. This time and place may just not be your thoughtfully curated home. But that doesn't mean you need to ditch the Halloween spirit entirely. These 12 Halloween decor ideas from Instagram are not for your average basic witch. 1. Don't ditch your black and white theme. Halloween doesn't have to mean orange everything. Try white mini-pumpkins, a silver skull, or black taper candles for a black and white look. 2. Skip the carving and paint your pumpkins. Painting an of-the-moment print onto pumpkins is a fun DIY project. 3. Mix pumpkins into your greenery. 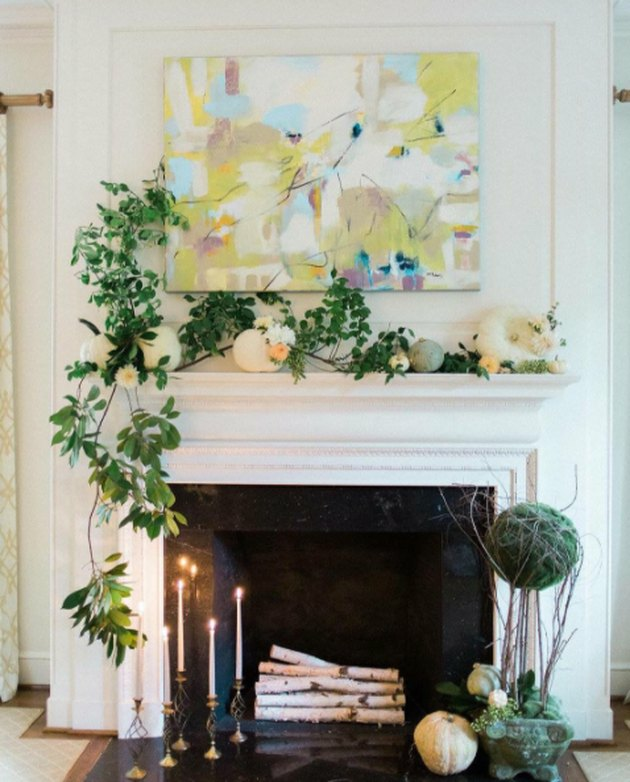 The pumpkins on this mantle seem to belong there — they're just part of the greenery. Try creating a natural look with your decor. It's easy for your place to look classy if you're sticking to an all-white look with varying textures. 5. Bat cut-outs are key. They're simple, spooky, and actually kind of stylish. 6. Get creative with gold foil. Another fun DIY project — artfully stick gold foil cutouts all over some pumpkins. 7. Make a mini-pumpkin garland. This simple DIY project just involves painting mini-pumpkins white and stringing them together to make a great mantle accessory. 8. Buy pumpkins that match your home's style. If your home has a certain look, work your Halloween decor into that. For example, a black, white, and gold pumpkin totally work in this space. Sometimes just not overdoing it is the way to create a great space. Halloween decor in neutral colors can look so nice. 10. Try a muted wreath. This wreath is pretty without having to be flashy and in-your-face. 11. Deck out your fireplace (tastefully). Some bats, some pumpkins, some ghosts... this mantle has a lot going for it, but still remains tasteful. 12. Try a new take on the classic jack-o'-lantern. If this pineapple jack-o'-lantern isn't hilarious, we don't know what is. Maybe try carving fruits instead of a pumpkin if you live in a warmer climate.